356 pages | 22 Color Illus. | 166 B/W Illus. Many books and reviews about scanning probe microscopies (SPM) cover the basics of their performance, novel developments, and state-of-the-art applications. 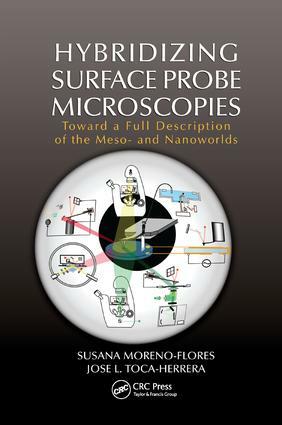 Taking a different approach, Hybridizing Surface Probe Microscopies: Towards a Full Description of the Meso- and Nanoworlds encompasses the technical efforts in combining SPM with spectroscopic and optical complementary techniques that, altogether, provide a complete description of nanoscale and mesoscale systems and processes from corrosion to enzymatic reactions. The book is organized into eight chapters, following a general scheme that revolves around the two main capabilities of SPM: imaging and measuring interactions. Each chapter introduces key theoretical concepts and basic equations of the particular stand-alone technique with which the scanning probe microscopies are combined. Chapters end with the SPM-technique combination and some real-world examples in which the combination has been devised or used. Most chapters include a historical review of the techniques and numerous illustrations to support key ideas and provide the reader with intuitive understanding. To understand the limitations of any technique also means to understand how this technique works. This book has devoted a considerable amount of space in explaining the basics of each technique as they are being introduced. At the same time, it avoids explaining the particularities of each SPM-based technique and opts for a rather generalized approach. In short, the book’s focus is not on what SPM can do, but rather on what SPM cannot do and, most specifically, on presenting the experimental approaches that circumvent these limitations. Adding Label-Free Chemical Spectroscopy: Who Is Who? Susana Moreno Flores graduated with a degree in chemistry at the Complutense University (Madrid, Spain), where she also did her doctorate studies at the Department of Physical Chemistry. Thereafter she did postdoctoral stays at the Department of Statistical Physics of the Ecole Normale Supérieure (Paris, France), at the Max-Planck Institute of Polymer Research (Mainz, Germany) and at the Chemistry Department of the University of Basel (Basel, Switzerland), before she worked as researcher in the Biosurfaces Unit at CIC BiomaGUNE (San Sebastián, Spain). She is currently assistant professor at the Department of Nanobiotechnology of the University of Natural Resources and Life Sciences (Vienna, Austria). José L. Toca-Herrera (Santander, Spain) is Professor of Biophysics at the University of Natural Resources and Life Sciences (BOKU-Vienna, Austria). After receiving his degree in Physics from the University of Valencia, he carried out a 12-month research training at the Max-Planck Institute for Polymer Research (Mainz) with Prof. Wolfgang Knoll. He completed his Ph.D. at the Max-Planck Institute of Colloids and Interfaces (Golm) under the supervision of Prof. Helmuth Möhwald. After several postdoctoral stays with Prof. Regine von Klitzing (TU-Berlin), Prof. Jane Clarke (University of Cambridge) and Prof. Uwe B. Sleytr (BOKU-Vienna), he joined in 2004 the Department of Chemical Engineering of the Rovira i Virgili University (Tarragona) as RyC research professor. In 2007 he moved to CIC BiomaGUNE (San Sebastián) led by Prof. Martin-Lomas as group leader. In September 2010, he joined the Department of Nanobiotechnology at BOKU (Vienna) where he leads the Laboratory of Biophysics.